Would you like to become wealthier and leave a financial legacy? Although there’s no proven way to get rich quick, there are three timeless principles you can follow to begin to build your fortune over time. This month’s information outlines principles of wealth from a book displayed on every entrepreneur’s shelf: The Richest Man in Babylon by George S. Clason. This book offers practical advice to develop smart money habits. Also listed are some helpful books and podcasts to complement your financial journey. Want a reputable financial pro to help keep you on track? 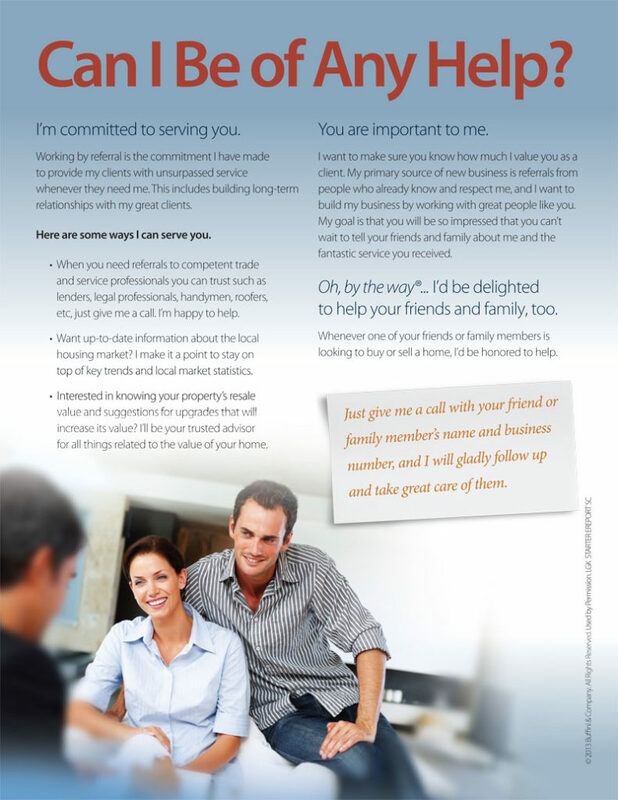 Give me a call – I have a great referral! The New Year is less than a month away; however, the best time to set goals for 2019 is now. If you’re like many people, you may wish to create goals pertaining to your finances, whether you wish to keep more of what you earn or achieve financial freedom once and for all. The excitement of the New Year prompts us to set ambitious goals; however, a month or two into the year, our goals have often long been forgotten. 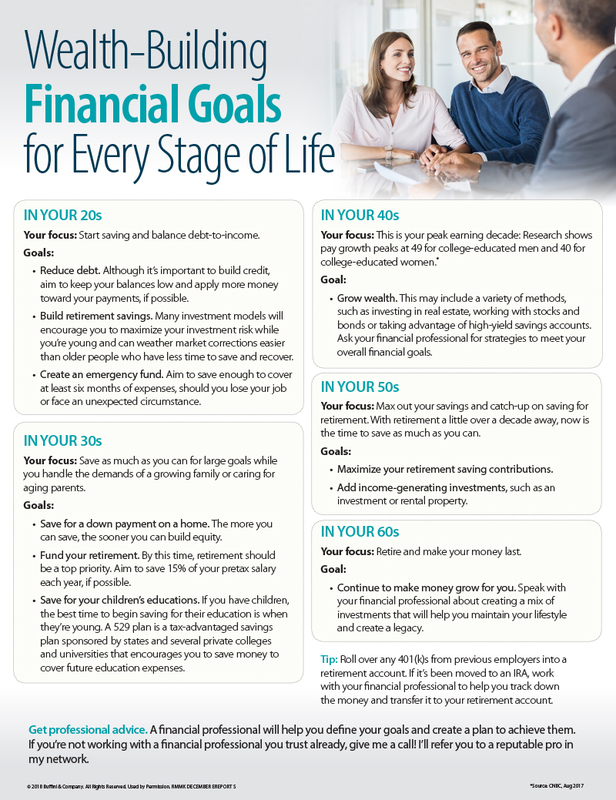 This month’s information is intended to encourage you to set realistic financial goals that you’re invested in achieving. From identifying what you truly want to setting SMART goals and creating a reasonable action plan, these tips will help you end 2019 even more financially fit than you are now. A financial professional can provide you with the advice you need to create sound financial goals and establish your legacy. If you’d like a referral to a reputable financial professional in our area, give me a call! Have a happy and healthy holiday season! The information for this month includes tips and strategies to guide you through your kitchen renovation. Page one provides an overview of emerging kitchen trends and suggestions to make a small kitchen appear more spacious. Page two outlines things to consider before embarking on your renovation and offers the average costs involved in major and minor kitchen renovations. Thinking of remodeling your kitchen? Give me a call and I’ll connect you with a reputable tradesperson in my network. If you’re thinking of selling your home soon, I can suggest the updates buyers are looking for to ensure it stands out in our market. Are you ready to retire? Whether you plan to retire in the next few years or in a few decades, saving for retirement is likely a top priority. After all, many of us wish to maintain our lifestyles after we’ve stopped working. This month’s information helps you figure out how much you may need to maintain your lifestyle in retirement. Although experts typically suggest saving up to 12 times your current income, the amount you’d like to save may be more or less, depending on the factors outlined on page one. For many people, the immediate demands of life and family prevent them from saving as much as they’d like. If that sounds like you, page two offers strategies to help get your retirement savings back on track. Whether you’d like to save more for retirement or build funds for a down payment on a home, give me a call! I’ll connect you with a reputable financial professional in my network. Interested in reducing debt? You’re not alone. According to recent studies, reducing debt is a goal for many Americans, regardless of how much they owe. Paying down debt not only makes good financial sense; it can have a wider impact as well. The information this month outlines seven reasons to reduce debt. The reasons range from the reduction of your monthly expenses and improving your long-term financial security to minimizing stress and modeling good financial habits for children and others seeking debt-free lives. If you’re already debt-free, the piece will reinforce the tremendous benefits of maintaining your lifestyle. 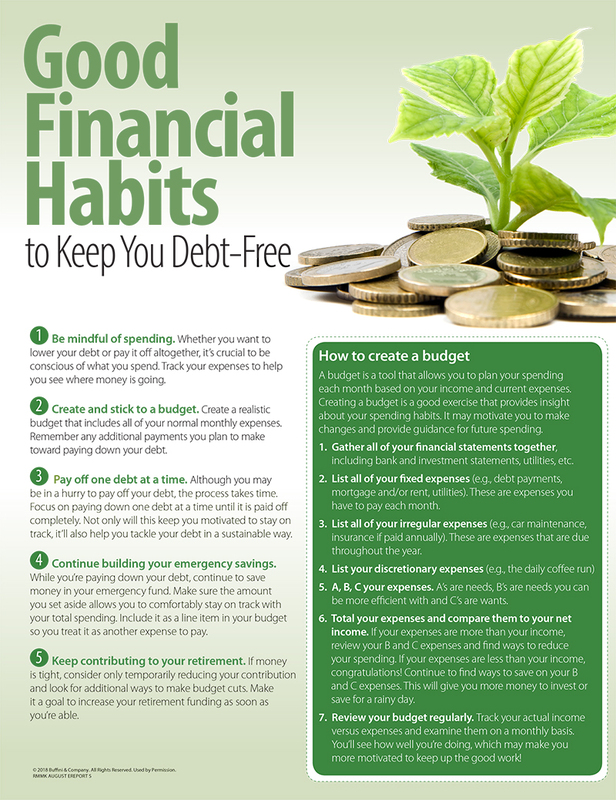 If you’d like to reach zero debt, page two provides several tips to help you on your journey toward your goal. Decluttering is not just something to do when you’re ready to move; it’s a process that will help you create more space and get organized. In short, you’ll simplify your life. 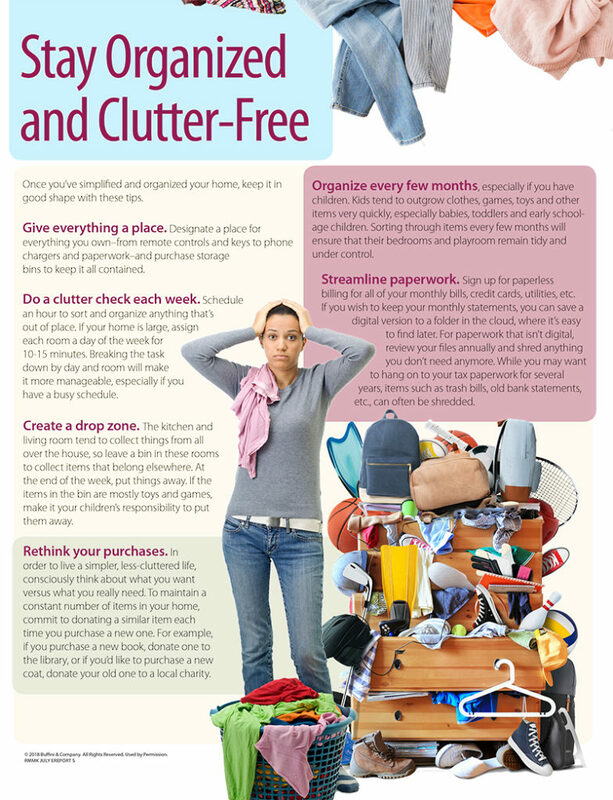 This month’s information intends to help you take control of your stuﬀ, eliminate what you don’t need or use and appreciate the items you use and enjoy. 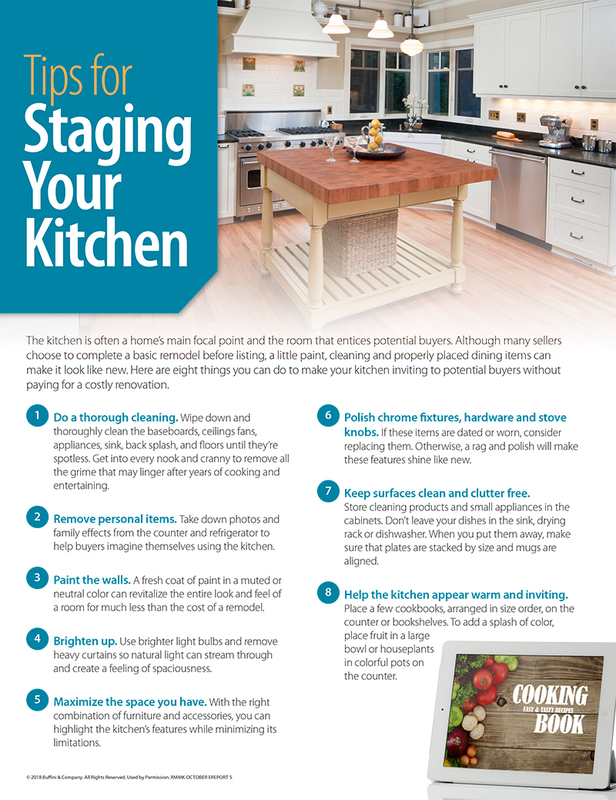 While page one outlines the ﬁve‐ bin approach to clearing the clutter, page two oﬀers useful tips to help you organize each room of your home. It also oﬀers suggestions to help you sort through items that carry sentimental value. When you reclaim your spaces from clutter, you may ﬁnd you have more room than before. However, if you’re thinking of upgrading to a larger home, give me a call. I’m happy to help you ﬁnd a home that meets your needs. Although many homeowners take on small renovation projects themselves, they often hire contractors to work on larger projects, including kitchen or bathroom overhauls and home additions. Regardless of the project, finding the right person for the job can be a challenge. 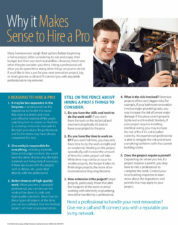 This month’s includes tips to help you hire the right contractor for your next home renovation project. In addition to offering tips intended to help you narrow down your list of contractors, the piece also provides several questions to ask the contractors you’re considering as well as the crucial details that should be included on the agreement with your selected contractor. Although the piece focuses on hiring a contractor, the tips provide a basic outline of things to consider if you’re hiring any type of building professional or tradesperson for a home project. If you’re considering a home renovation, give me a call. I can refer you to reputable contractors and tradespeople in our local area or advise you on renovations that may increase your home’s value. Good credit pays off. Even if you’re not planning to borrow money to make a large purchase, good credit may qualify you for better insurance rates, help you avoid paying security deposits when you sign up for new cell phone service or even help you negotiate a better rate on a vacation rental. This month’s information not only outlines some of the benefits of great credit, it also provides ways to improve it. Page one delves into eight benefits of having good credit, from qualifying for lower interest rates on loans and credit cards to improving your chances of getting a great job. 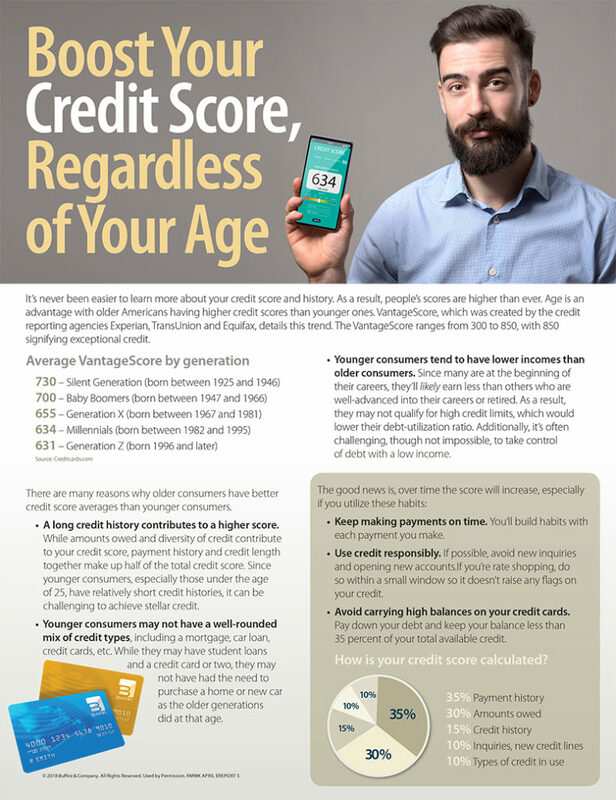 Page two provides five tips to help you improve your credit score. If your credit is already great, the tips will help you ensure it remains high. If your credit is already stellar, feel free to pass this information along to someone else who may benefit. 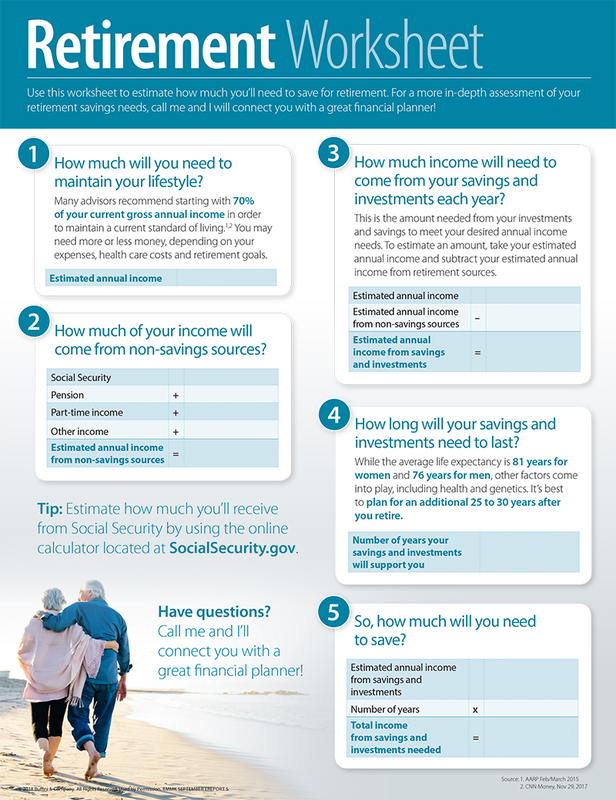 This information is intended to help make financial goals more achievable. 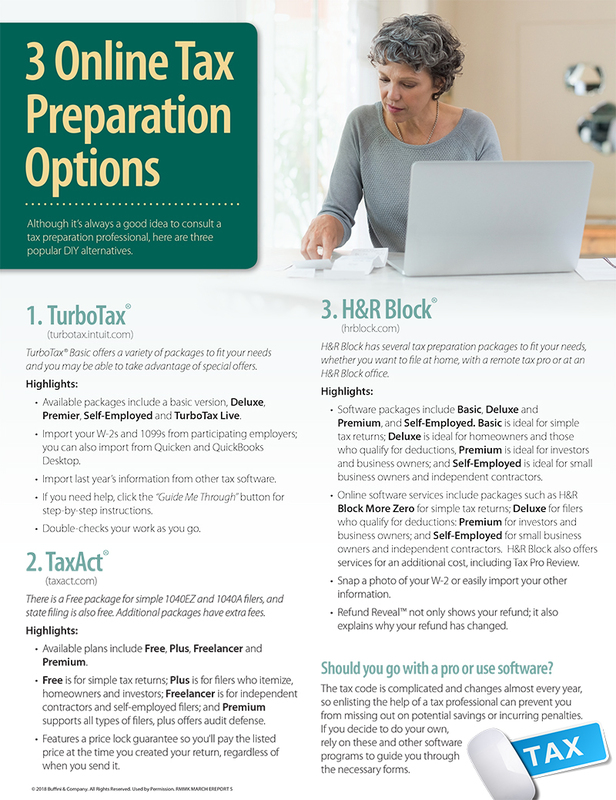 The information for this month is intended to prepare you for tax time. Page one provides a list of financial details you may need to gather ahead of time to make the process easier, as well as some tips to help you get your refund faster. Page two outlines steps to take to help you protect your identity from thieves who wish to gain access to your information. What will the year hold for the real estate market? Will the market favor buyers or sellers? Will home prices continue to rise? While it’s impossible to predict the future, experts rely on current market trends to forecast what may happen this year, if present trends continue. Let’s start the year with information that outlines several predictions experts have made about the national housing market in 2018, as well as a few predictions about mortgages. How do these trends stack up to trends we’ve seen in our local housing market? Give us a call and we’ll give you the scoop! The information also delves into three reasons why learning about the market is important, even if you don’t plan to buy or sell this year. If you are thinking of buying or selling, or you just want to know more information about our local market, give us a call!